In materials science, deformation is a change in the shape or size of an object due to an applied force (the deformation energy in this case is transferred through work) or a change in temperature (the deformation energy in this case is transferred through heat). The first case can be a result of tensile (pulling) forces, compressive (pushing) forces, shear, bending or torsion (twisting). In the second case, the most significant factor, which is determined by the temperature, is the mobility of the structural defects such as grain boundaries, point vacancies, line and screw dislocations, stacking faults and twins in both crystalline and non-crystalline solids. The movement or displacement of such mobile defects is thermally activated, and thus limited by the rate of atomic diffusion. Deformation is often described as strain. As deformation occurs, internal inter-molecular forces arise that oppose the applied force. If the applied force is not too large these forces may be sufficient to completely resist the applied force, allowing the object to assume a new equilibrium state and to return to its original state when the load is removed. A larger applied force may lead to a permanent deformation of the object or even to its structural failure. In the figure it can be seen that the compressive loading (indicated by the arrow) has caused deformation in the cylinder so that the original shape (dashed lines) has changed (deformed) into one with bulging sides. The sides bulge because the material, although strong enough to not crack or otherwise fail, is not strong enough to support the load without change, thus the material is forced out laterally. Internal forces (in this case at right angles to the deformation) resist the applied load. Typical stress vs. strain diagram with the various stages of deformation. This type of deformation is reversible. Once the forces are no longer applied, the object returns to its original shape. Elastomers and shape memory metals such as Nitinol exhibit large elastic deformation ranges, as does rubber. Soft thermoplastics and conventional metals have moderate elastic deformation ranges, while ceramics, crystals, and hard thermosetting plastics undergo almost no elastic deformation. Where σ is the applied stress, E is a material constant called Young’s modulus, and ε is the resulting strain. 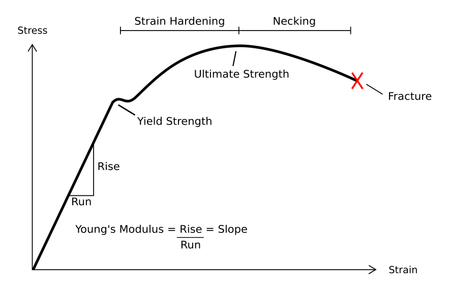 This relationship only applies in the elastic range and indicates that the slope of the stress vs. strain curve can be used to find Young’s modulus. Engineers often use this calculation in tensile tests. The elastic range ends when the material reaches its yield strength. At this point plastic deformation begins. 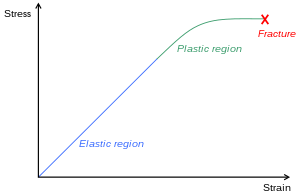 Note that not all elastic materials undergo linear elastic deformation; some, such as concrete, gray cast iron, and many polymers, respond nonlinearly. For these materials Hooke’s law is inapplicable. This type of deformation is irreversible. However, an object in the plastic deformation range will first have undergone elastic deformation, which is reversible, so the object will return part way to its original shape. Soft thermoplastics have a rather large plastic deformation range as do ductile metals such as copper, silver, and gold. Steel does, too, but not cast iron. Hard thermosetting plastics, rubber, crystals, and ceramics have minimal plastic deformation ranges. One material with a large plastic deformation range is wet chewing gum, which can be stretched dozens of times its original length. Under tensile stress plastic deformation is characterized by a strain hardening region and a necking region and finally, fracture (also called rupture). During strain hardening the material becomes stronger through the movement of atomic dislocations. The necking phase is indicated by a reduction in cross-sectional area of the specimen. Necking begins after the ultimate strength is reached. During necking, the material can no longer withstand the maximum stress and the strain in the specimen rapidly increases. Plastic deformation ends with the fracture of the material. Metal fatigue has been a major cause of aircraft failure, such as the De Havilland Comet, especially before the process was well understood. There are two ways to determine when a part is in danger of metal fatigue; either predict when failure will occur due to the material/force/shape/iteration combination, and replace the vulnerable materials before this occurs, or perform inspections to detect the microscopic cracks and perform replacement once they occur. Selection of materials not likely to suffer from metal fatigue during the life of the product is the best solution, but not always possible. Avoiding shapes with sharp corners limits metal fatigue by reducing stress concentrations, but does not eliminate it. Loading a structural element or a specimen will increase the compressive stress until the reach of compressive strength. According to the properties of the material, failure will occur as yield for materials with ductile behaviour (most metals, some soils and plastics) or as rupture for brittle behaviour (geomaterials, cast iron, glass, etc). Diagram of a stress-strain curve, showing the relationship between stress (force applied) and strain (deformation) of a ductile metal. A popular misconception is that all materials that bend are “weak” and those that don’t are “strong.” In reality, many materials that undergo large elastic and plastic deformations, such as steel, are able to absorb stresses that would cause brittle materials, such as glass, with minimal elastic and plastic deformation ranges, to break. ^ Peter Rice, Hugh Dutton (1995). Structural glass. Taylor & Francis. p. 33. ISBN 0419199403. http://books.google.com/books?id=7t9wgJEUWHYC&pg=PA33.